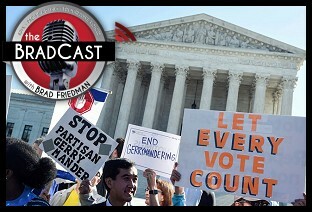 " The Fight to End Gerrymandering in a World Without Justice Kennedy: 'BradCast' 6/29/2018	"
« PREVIOUS STORY "On Political Courage and 'Not Getting Lost in a Sea of Despair': 'BradCast' 6/28/2018"
"The Fight to End Gerrymandering in a World Without Justice Kennedy: 'BradCast' 6/29/2018"
Listening to you on Terrence's podcast right now! Sounds good, and I like his interviewing style. Just subscribed in Doggcatcher. Thanks for the tip! This will be a very long campaign, but Congress can, must, and will abolish gerrymandering?, only if we demand it. "the Congress may AT ANY TIME by Law"
That would require both House and Senate to pass that law, and a President's signature (or veto override). Or, one Supreme Court decision holding gerrymandering unconstitutional.